Ebba H. Bernadotte was a Swedish princess and a philanthropist. Ebba Henriette Bernadotte grew up within an officer’s family in Jönköping. Her father was the colonel of the local regiment. After his death in 1882 Ebba Henriette Bernadotte became a lady-in-waiting to Crown Princess Victoria, and remained as such until 1886. In 1885 she was in Amsterdam with the Crown Princess and met Prince Oscar there. Following a two-year reflection period their engagement was announced and the couple were given permission to marry as long as Oscar abdicated his right to the throne along with all the attendant privileges due to him and his descendants. The wedding took place in Bournemouth, England in 1888. The couple were endowed with the titles of Prince and Princess Bernadotte. The celebrant at the ceremony was the renowned Stockholm priest Gustaf Emanuel Beskow, the father of Elisabeth Beskow. Four years later Ebba H. Bernadotte and her husband were given the additional titles of Count and Countess of Wisborg by Duke Adolf of Luxemburg, who was Oscar’s maternal uncle. 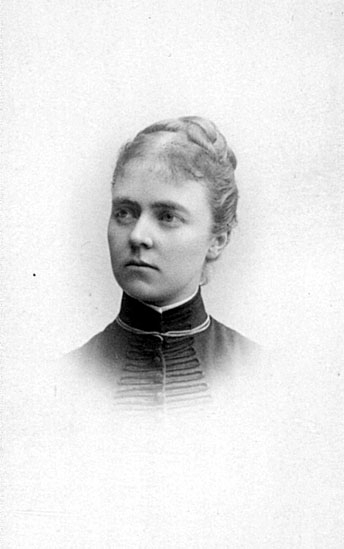 Ebba H. Bernadotte largely lived her life out of the limelight and focused on her home and various forms of Christian philanthropy, particularly missionary work. The couple had five children: Maria Bernadotte, Carl Bernadotte, Sofia Fleetwood,  (Elsa Cedergren), and Folke Bernadotte. The marriage between Ebba H. Bernadotte and Prince Oscar was a scandal at the time because Ebba H. Bernadotte was a commoner. Within conservative circles there was talk of how this posed a threat to the monarchy whilst the popular press viewed the development as romantic and fairytale-like. It did not take long before the negative viewpoints were silenced. The princely couple were, however, sometimes subject to ridicule later in caricature form because of the deeply religious aspect of their social lives and their activities. The couple moved to Karlskrona after they got married as Prince Oscar took up an appointment there within the navy. He and Ebba H. Bernadotte were both heavily active in Karlskrona and served as Sunday-school teachers at the Sunday school set up by Commander and Baron Edvard Barnekow. The couple spent four years in Karlskrona. In 1892 they moved to Östermalmsgatan in Stockholm, and this remained Ebba H. Bernadotte residence until her death. Ebba H. Bernadotte and Prince Oscar were deeply religious and highly active in the revivalist movement prevalent among officers and upper nobility of Stockholm, which had been started by Lord Radstock in the 1880s. Other members of the royal family, including Queen  (Sophia) and Princess  (Eugénie), were also involved in this movement. The princely couple spent a sizable amount of their time doing religious and philanthropic work. For example, they held regular nonconformist religious gatherings in their home. This serious interest in missionary work also meant that Ebba H. Bernadotte threw herself into various missionary associations. From 1893 onwards she was a member of the board of the Lapska missionens vänner (friends of the Lapp mission) – her husband had been the chair of the mission since 1899, and the position had previously been held by Queen Sophia and before that by Princess Eugénie. They maintained this activity until the society dissolved in 1934, when it was taken over by the Svenska missionens vänner (friends of the Swedish missionary society). The princely couple made several visits to Lapland whilst undertaking and recording the work of the mission there. From 1898 to 1929 Ebba H. Bernadotte was also a member of the board of Kvinnliga Missions Arbetare (female mission workers’ association). This group was focused on missionary work amongst the Sápmi but also undertook work in North Africa, India, Mongolia, Armenia, and China. Ebba H. Bernadotte was furthermore chair of Daggryningen, an organisation comprising children’s and youth groups which particularly supported the China missionaries. In addition she also served as chair of Bokpåsemissionen för sjömän (bookbag mission for seamen) for a time. Ebba H. Bernadotte also lent her support to other Christian associations. For example, she was a member of the board of Kristliga föreningen av unga kvinnor (KFUK) (young Christian women’s association) in Stockholm from 1897 to 1912. Her husband was similarly engaged with the Kristliga föreningen för unga män (KFUM) (young Christian men’s association). During the latter years of her life she was also active within the Salvation Army. Ebba H. Bernadotte died in 1946. She is buried in the Bernadotte af Wisborg family grave at the Norra cemetery in Solna. Ebba Henriette Bernadotte, www.skbl.se/sv/artikel/EbbaHenrietteBernadotte, Svenskt kvinnobiografiskt lexikon (article by Charlotte Tornbjer), retrieved 2019-04-23.